Thanks everyone, for being so helpful. The guitar works fine, the pickups sound beautiful. My only problem is that when I take my hands off the strings/bridge the guitar starts buzzing. Is this symptomatology consistent with a faulty earth connection to the spring claw? If so, then I shall take everything apart and put it together again (painful job). That's the problem Jay, there's just no way to offer you any certainty. Such are the whims of passive guitar wiring. 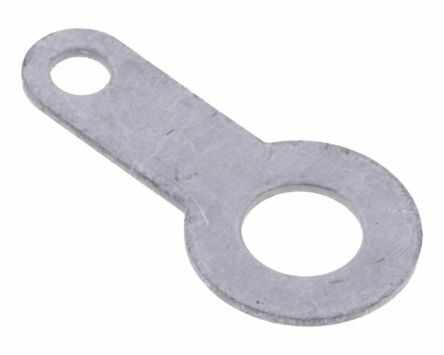 The only possible additional test I could suggest would be a lead with a crocodile clip on one end connected to the sleeve of a 1/4" jack plug at the other. You could clip it to a string at the headstock and plug the jack plug into an amp or mixer. That would give you a direct string ground. If that resolves the problem when you take your hands off the strings you can be confident you have a string ground problem. But It won't tell you exactly what the details of the problem are. However, if you have a flux pen it would be worth reflowing the string ground connection to the back of the pot first. Now I hope you see the frustration that lead me to my practice of pulling out the loom, cleaning and servicing the pots, sockets, and switches and rewiring from scratch. In 20 plus years that has only failed me once (and I am convinced that the niggling low level buzz on that strat is more to do with the roller nut, on paper it can take 11's but I have a feeling that a mechanical buzz too low to pick up by ear is affecting the string vibration just enough to come through on the pick up when you up the gain). Every other time, it has always been quicker to rewire than spend hours with a meter trying to track down the specific cause. A scratch plate based pickup set is so much easier to re-wire - but I'll get down this weekend and re-do this guitar, hopefully things will work better. I'll also use the opportunity to re-paint the pickup cavities. As the buzz comes from taking your hands off the strings, that shows that the strings are grounded properly. 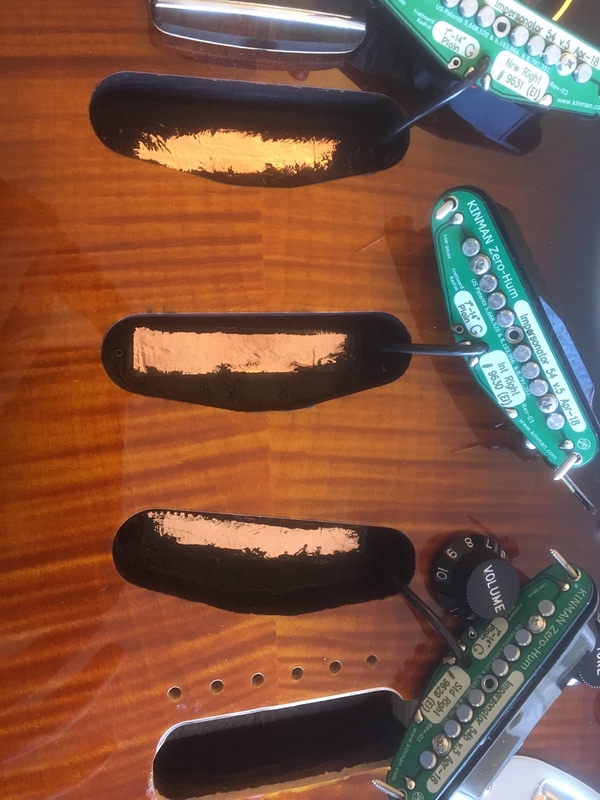 Your body is being given a good connection to ground, and either a) any electrical noise your body is picking up/giving off is taken to ground so it doesn't affect the pickups or b) your body now acts as an effective soak for a lot of the EMI floating around (or a mixture of both). Shielding the pickup cavities isn't standard for a Les Paul (though it's a good idea for those fitted with P90s). Gibson keep changing their control cavity arrangements, but on my very new 2018 LP Classic Goldtop (with P90s), they've got the pots connected to a metal shield plate (like they have done in the past), which helps. they've also added a small tag board, which minimises the soldering they have to do to the back of the pots. With covered pickups with shielded cables, there's not a lot of point in adding more shielding to the pickup cavities. 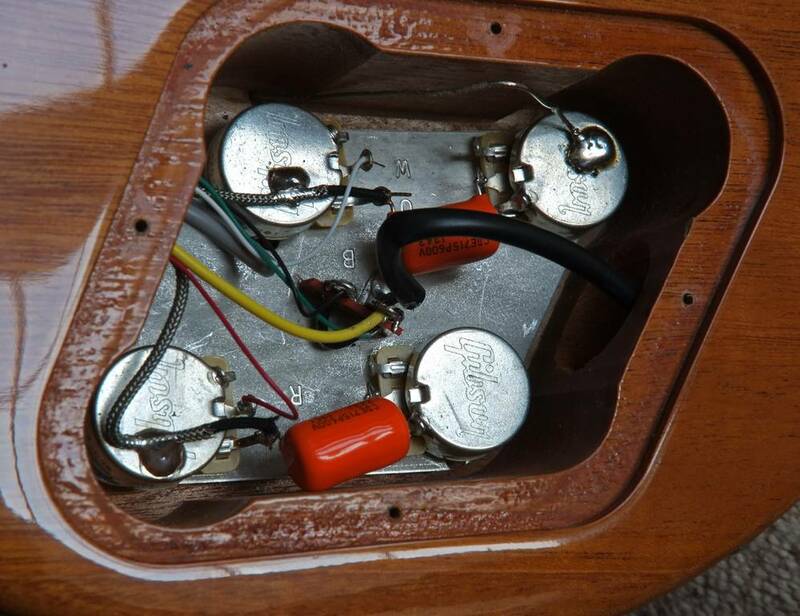 Even with uncovered humbuckers, you normally don't get enough noise problems to make shielding the cavities necessary. Also on most guitars with non scratchplate mounted pickups, it's near impossible to shield the cable passageways to them, so you'll never manage complete shielding coverage. But every bit of extra shielding will bring the noise levels down slightly, so if you are getting noise issues, then it's certainly worth adding as much shielding as you can. The noise has to come from somewhere though, so unless you are near to a powerful radio mast, it's worth checking around your house for any sources of electrical noise which can be turned off, especially when recording, e.g. dimmer switches and fluorescent lights. Jay Menon wrote: My only problem is that when I take my hands off the strings/bridge the guitar starts buzzing. Picking up on a point Max (SSG) made in his characteristically brief and enigmatic way earlier, the problem could be that the issue here is actually the grounding (or lack of it) of you as the player. For example, when you touch the (already effectively grounded) strings your body will become grounded, and thus act as an additional shield around all the guitar's sensitive high-impedance bits. But when you become ungrounded you lose that shielding ability and/or you may even act as a aerial to inject noise into the back of the guitar. There might be continuity between the trem claw and the jack sleeve but are all the strings actually bonded to the guitar's earth? ***t or bust test. Wrap the whole body of the guitar in turkey foil and make sure that bonds to earth. If the bugger still buzzes after that (wear Marigolds) there is little more you can do! Thanks everyone. I think I might have figured out what the problem is. On a conventionally routed Stratocaster the body of the switch/and the two fixing screws, bond to the aluminium foil on the rear surface of the scratch plate. This guitar being rear routed, the switch only attaches to the graphite painted floor of the cavity. The body of the switch isn’t grounded. When I touch the two anchoring screws of the selector switch the buzz disappears. When I do a continuity test between the screws attaching the pickup selector switch and other ground points I’m not getting continuity. It's probably not the only cause, but it can only help matters. You could fit a suitably-sized crimp washer to a bit of wire, then fit that on the switch, and solder the other end to the back of a pot. Alternatively, a solder tag and a shake-proof washer fitted between the switch body and wood, with an earth wire linking it back to the guitar's single earth point might be quicker and easier. Hugh, if that idea was off the top of your head, you are an absolute genius (and even if it came from previous experience that still makes you a wise man). Solder tag utilised - robust electrical continuity achieved between selector switch screw and tone pot casing. Now she’s dead silent - no buzz when I take my hands off the metal parts. I thought you’d find that interesting! So you were right - on rear routed instruments, graphite painting the pickup cavities really helps. I suppose you can think of them as a Faraday cage with a hole in. The effectiveness of a Faraday cage (note the word cage rather than solid enclosure) comes down to the largest sized hole it it, which corresponds roughly to the shortest wavelength it will stop entering. So a hole that size will be good for most radio waves down to the start of microwaves. I did do physics at Uni. But I did have to improve my basic knowledge on the subject of Faraday cages fairly recently by searching the web.